With the growing popularity of health awareness, the nutraceutical market is in high demand. A hybrid of nutrition and pharmaceuticals, the nutraceutical market provides more health-conscious solutions for consumers. Whether it’s a function food or beverage, dietary supplements or nutri-cosmetics, nutraceuticals are popular and in high demand. Due to nutraceauticals being a relatively new phenomena , manufacturers of nutraceuticals are turning to packaging printers and designers to create exceptional packaging designs that are the perfect balance of “beauty” and “pharmaceutical.” The industry, however, has unique challenges. Unlike typical over the counter cold medicine type products, nutraceuticals are usually the end-result of long-term research and exclusive formulations developed for the health-focused consumer. 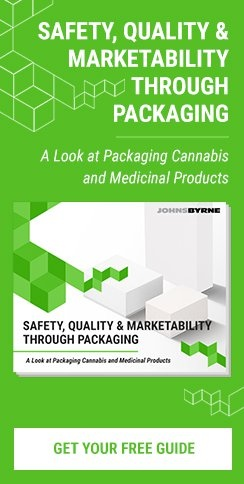 This requires that packaging enhance product credibility, support the brand’s connection to its natural roots and confirm perceived efficacy and value. Let’s analyze how packaging can do just that for the nutraceutical industry. Similar to pharmaceutical packaging where active ingredients and expected benefits are clearly spelled out, nutraceutical packaging is a practical and effective vehicle to educate consumers and enhance product credibility. Unlike typical cosmetics or other products, potential consumers of nutraceuticals have to be first convinced that the product can do what it claims to do. The ability to read ingredients and identify the unique formulation of nutraceuticals allows consumers to embrace the product’s promise. By listing key aspects of the product’s formulation or other unique health-focused attributes, nutraceutical packaging can increase product credibility. 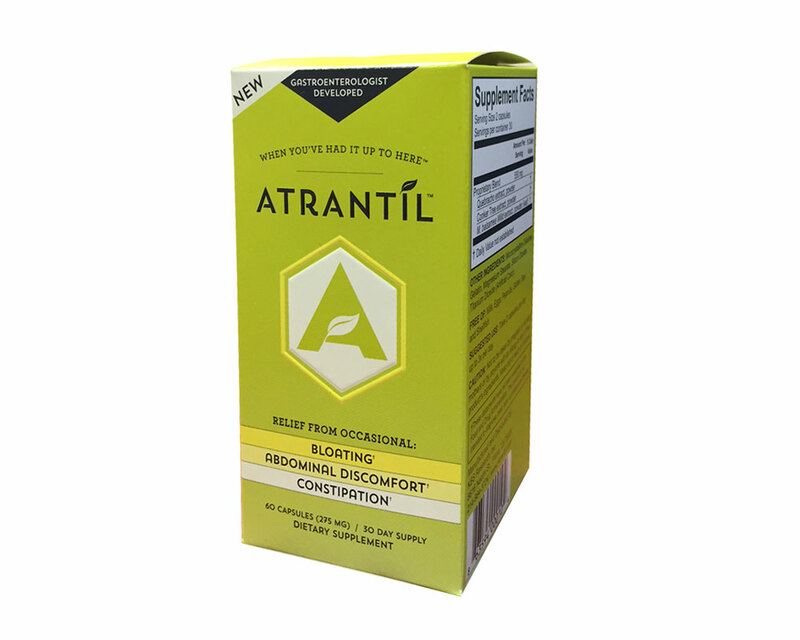 To support claims of efficacy, Atrantil clearly provides supplement facts. Moreover, it states gastroenterologists developed the product. Clearly identified nutritional facts and backing from experts translate into credibility. Health brings cheery colors to mind. Greens, yellows and oranges reflect happy and healthy states that help a package enforce its foundational health roots. Atrantil’s use of light greens, yellows and a neutral palette of black and white are colors consumers identify with nature. 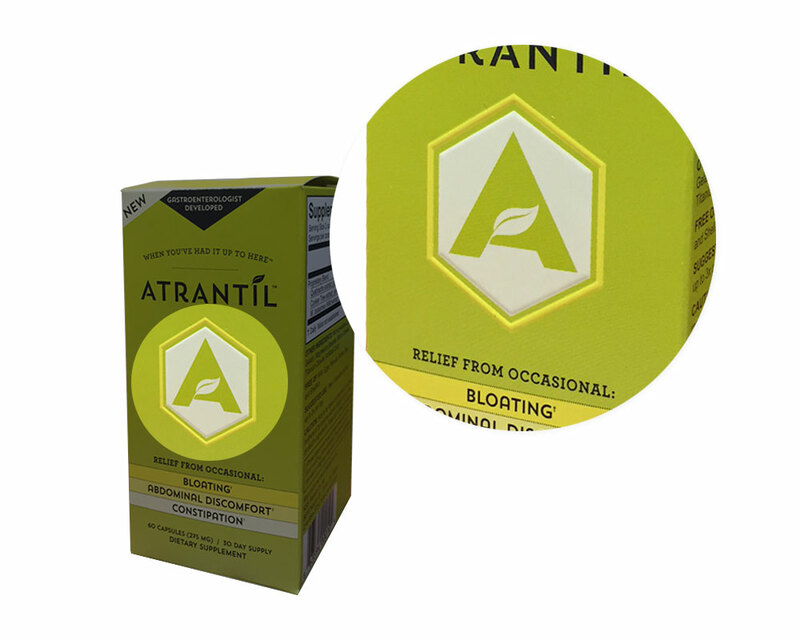 Made from natural botanical extracts, Antrantil promises to be healthy option for digestive discomfort. By choosing this nature-mimicking color palette, Atrantril reinforces its foundation of natural ingredients. The quick supplement facts also help emphasize the simple ingredient list of the product. From the well-known brands to emerging brands, graphics are key to creating a memorable and impactful design. By using graphics that remind consumers of nature, packaging designers can further drive home the message of a healthy formulation. Just like nature, Atrantil’s graphics are simple and beautiful on their own. A simple graphic and the use of a leaf are also direct ties to mother nature. Just as graphics and colors support the message of healthy formulations, the composition of the overall packaging should also support the message of an environment-friendly, good-for you brand. Nutraceutical packaging can benefit from choosing materials that are sustainable, easy to recycle or made from recyclable materials. Nature is uncomplicated and beautiful at the same time. How can packaging recreate this? Nutraceutical packaging is best received when its design is a simple statement focused not on looks but on nature. Focusing on only a few finishing effects creates an overall polished, and professional look. 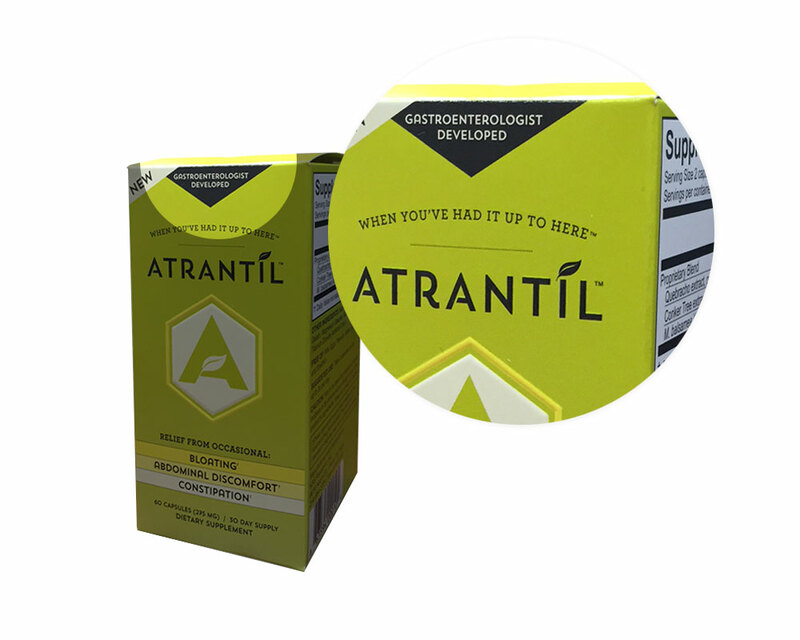 Atrantil’s overall simple packaging design delivers on the overall brand promise. The sophisticated carton packaging educates consumers, enhances credibility, reinforces a return to nature, and maintains a focus on the product promise. Given their unique environment, nutraceutical packaging must cater to the demographic and buyer trends to attract consumers in these locations. Moreover, given that the price range for nutraceuticals can be high, it’s important for packaging to convey the value of the product. The application of coatings and finishes on nutraceutical packaging confirms the price tag value, making consumers more likely to make the purchase. 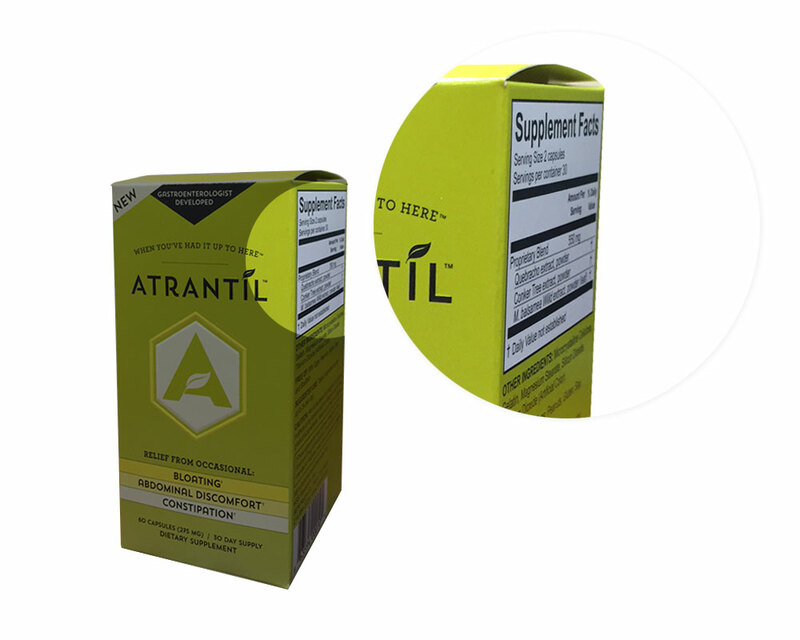 Due to unique formulations, retail environment and target consumers, the nutraceutical industry has unique challenges when creating packaging that accurately conveys its message. By focusing on enhancing product credibility, supporting the brand’s connection nature, and affirming perceived value, packaging designers and engineers can create a wining packaging design.